Following up a post from yesterday, we heard a Target employee noticed prerecorded movies distributed on Sony UMDs (an acronym meaning UnMitigated Disaster, um, rather, Universal Media Disc) were suddenly absent from the store where he worked, and from other Target locations, too. Now our beloved brothers at Kotaku have found confirmation from another reader, saying the chain has decided to devote shelf space to other products, but noted that Target will keep trying to move those slow-selling PlayStation portable UMD disks on its web site. Kotaku sleuths further confirmed by calling a couple of local Target stores, which admitted that the doomed UMD products were indeed no longer on sale at Target retail outlets. Can every other store in the world be far behind? 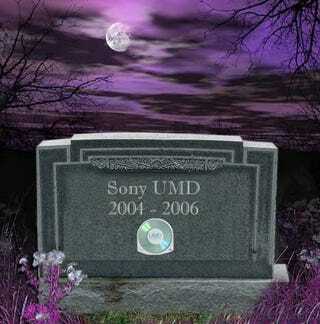 Die, UMD, die! And every other proprietary format! And the horse you rode in on!